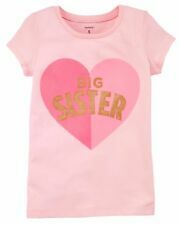 This T-shirt features a cute embroidered yoke design on the front she is sure to love. Raglan detail. Embroidered yoke neck. Gem Geo Butterfly Tee. Gymboree Yellow and Black. Poplin geo print appliqués plus embroidery. Black sleeveless t-shirt with gray and white lettering and logo print. Be aware that colors may be slightly off as computer monitors vary. I have no problem working with you and your specific needs. We will be happy to guide you through the process. NWT Janie and Jack Peplum Lavender Floral Top with Blue Flowers, Size 6, Cotton. NWT Janie and Jack Peplum Lavender Floral Top with Blue, Navy, White Flowers, Size 6. Round Navy collar. Buttons in the back for easy dressing. Fully lined in 100% cotton. Condition is New with tags. Shipped with USPS First Class Package. Machine washable. 100% cotton jersey. Embroidered heart with rhinestone. Inside neck trim for comfort. BY JUMPING BEANS. GIRL'S LOVE OUR PLANET GLITTER ACCENT SHORT SLEEVE T-SHIRT TOP. IVORY (OFF WHITE/CREAM). BY JUMPING BEANS. LIGHT PINK. Girls Joyfolie Size 6 Brianna Top On Opal Gray. Condition is New with tags. Shipped with USPS First Class Package. Never worn with tags. Pet and smoke free home. I have other boutique clothing and shoes on my Ebay store please look and follow. NWT size 2 (6-10 size girls). NWT Ralph Lauren Girls Long Sleeve Oxford Button Down Shirt MSRP $45 Size 6. Condition is New with tags. Ruffles down the front. Tag states the color is raspberry. It comes off as a red or dark pink. Please let me know if you have any questions. I have many other items listed please take a look. NEW NWT Janie and Jack Top. From the Fresh Daisies Collection. 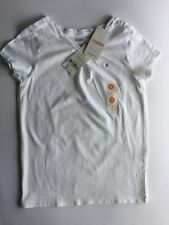 Bought new for my daughter and never worn. Color: Pink with black writing. Size: Small 5/6 Toddler. 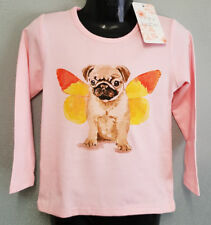 GIRL'S KITTY CAT WITH FLOWERS & BUTTERFLIES TULIP HEM T-SHIRT TOP. BY JUMPING BEANS.